I don’t know why we waited so long to tackle this one, but we’ve finally been able to release our brand new feature that lets you automatically create Facebook VIDEO ads. While we’re still in beta mode for this feature, you are certainly already able to start driving some very targeted traffic back to your site! In a minute, I’ll share a cool little case study on how quick and easy you can get started, but first, let me explain WHY you should consider Facebook VIDEO ads, in case you haven’t thought about using it for your business yet. Here are 5 quick reasons why you should adopt Facebook video ads into your business ASAP! Seriously, the first time I tried YouTube Video Ads, it almost broke my head! And in fact, that was part of the original inspiration for creating the Veeroll platform in the first place! Facebook has done a pretty awesome job at making it SUPER easy to get your first video ad up an running though. I think the reason it’s so much easier (especially for newbies) is that they’ve created different “levels” for being able to create your video ads. For example, the quickest and simplest way, by far, is to simply upload a video to your Facebook business page, and then you just boost the post. The next level up, is where you can use their wizard to create a more advanced kind of video ad. And then they have the Power Editor for all the professionals out there of course. Along with being easier, it’s also faster to setup Facebook Video Ads than YouTube Video Ads. But not only is it faster to setup, you also get to see actual results (as in views, clicks and conversions) happening MUCH faster than on Adwords. You start getting results almost INSTANTLY on Facebook video ads, whereas with YouTube Video Ads, you often have to wait at least a day before you start seeing any real results inside the Adwords platform. In other words, you can learn so much faster with your campaigns, because the cycle time between creating your campaign and seeing a result is so much shorter! As with YouTube Video Ads, Facebook Video Ads are also super affordable right now. Up until recently, a video view on Facebook was registered after only 3 seconds. As an advertiser, it’s exactly at that point where you would pay for the view. Today of course, you only get charged for the view after the video has been played 10 seconds! 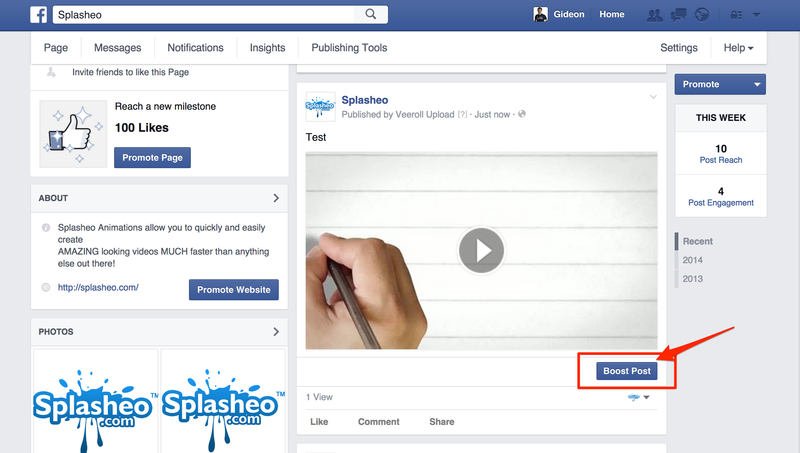 This one little thing could make your Facebook Video Ads A LOT more affordable. But please do test this of course! The setup on Facebook is still not quite as good as on YouTube Video Ads in this respect (video views only get registered after 30 seconds on YouTube). But tell you what… it’s pretty darn awesome still! From my initial testing, it seemed a heck of a lot easier to find the right targets on Facebook. Even though I am still a relative “noob” at this, I was able to quickly find some VERY relevant audiences to show my ads to. What was interesting with my test (below) is that the results I got from the targets I selected, compared to the very targeted email list that I uploaded as a target performed very similarly. In other words, it seemed like the fresh NEW targets I found using the Facebook targeting performed almost on par with a target audience who ALREADY knows and trusts me. Pretty rad if you ask me! Once again, I reckon Facebook has an edge on YouTube Video Ads even with their reporting. It seems like they’ve given a lot of thought to the progression that people would go through as they get started with Facebook Video Ads. As you start going through the process the first time, the default reporting is pretty simple (and limited). But then, as you dig in more, you get access to A TON more data. This is nice for the data freaks among us! So, a few weeks ago, even before we had our new Facebook feature ready, I decided to setup a “manual” test… just to see how it would all pan out. Results were pretty nice… especially considering that this was my first ever proper Facebook Video Ad test. Yes, granted, it’s only a tiny case study, and we need to run many more (and bigger) experiments… but you’ll have to agree that the following case study looks very promising… especially if you consider how fast and easy it was for me to setup, AND that I did ZERO optimisation whatsoever! Test 1 got 40 conversions at a cost of $3.96 per conversion, with website traffic converting at a VERY comfy 51%! The results are not “amazing”, but they are not “terrible” either… especially if you consider this is really just my first go at it and I am still learning! For that particular business, getting any leads for under 5 bucks is pretty nice. And of course, with some more elbow grease and optimisation, I am sure I could bring the cost per conversion down even further. But get this… the whole process of setting up these ads took VERY little time. So, overall, I was pretty impressed. As I mentioned earlier, the Facebook Video Ad feature inside Veeroll is still in beta, so the functionality is still a little limited right now. For now, you can only create a video, and then upload it to your Facebook Page. You DO, however, now have the option of first uploading the video as a draft, so that you can preview it first before making it go live on your timeline. Very soon, we’ll add a bunch of other features, including being able to create WHOLE campaigns right from inside Veeroll! Patience my dear… coming soon! Select one of the templates inside the “Facebook Ads” area under Create/Templates. Select one of the music tracks for the background music for your video. Enter the name and details of your video, and hit the submit button. And voilà! You’re done creating your video. It should take around 15 minutes to process your video in most cases. But if it takes longer than an hour, just contact our support team and we’ll sort things out for you. Once your video has been processed, you’ll receive an email notification that your video is ready for the next step. Next, go to the Upload area, and go through the steps to upload your video to your Facebook page. Once the video is on your timeline, you can boost the post to give your video a lot more exposure really quickly. Should You Still Be Doing YouTube Video Ads? Of course you should be still running YouTube video ads! 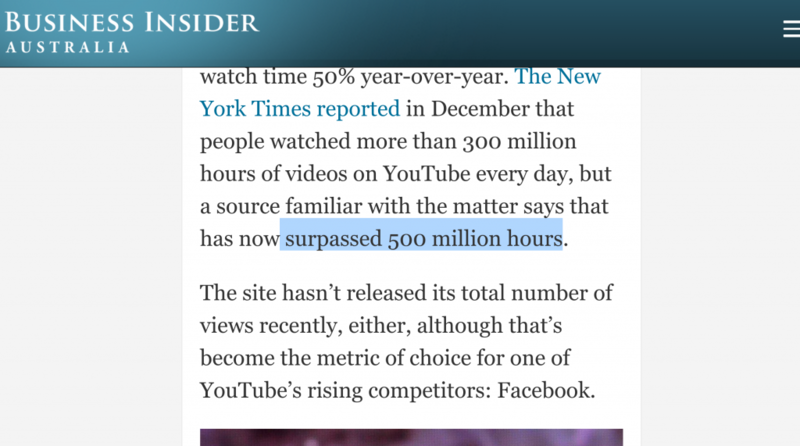 An article inside Business Insider recently pointed out that YouTube gets around 500 MILLION hours worth of video watched on their platform… EVERY SINGLE DAY! To put things into perspective, according to my buddy Jake Larsen from Video Power, you could fit around 40 Super Bowls onto YouTube EVERY SINGLE DAY! And what is more, as far as I can tell, there is STILL a MASSIVE oversupply of ad inventory on YouTube, that advertisers simply cannot fulfil. Meaning that traffic over at YouTube is still dirt cheap! In other words, YouTube is still the 800 pound gorilla when it comes to video advertising. And you’d be foolish not to have YouTube ads as part of your video ads arsenal. Yes, at this stage, Facebook video ads certainly seems a little easier to get into than YouTube video ads. But that also means that it will get crowded MUCH faster than YouTube. And of course, YouTube/Google has a MUCH more mature advertising platform than Facebook. For example, you might have noticed that it’s next to impossible to try and talk to anyone at Facebook. Whereas with Adwords, you can call someone at any time if you need advice on your campaigns. I’m sure Facebook will improve their support over time, but for the time being, the support you can get from Adwords far outperforms that of Facebook. But perhaps I’ll create another little post soon explaining in more detail why you should always have YouTube video ads as part of your advertising arsenal. For now, if you haven’t already, go check out this Facebook video ads thing. And if you don’t have access to Veeroll yet… by golly! It’s about time! To check out our offering, please visit our pricing page here. CLICK HERE to get our best video advertising tips in your inbox. It’s FREE! Sign up for free to discover how you can make highly effective video ads in less than 10 minutes!